The presynaptic neuron (top) releases a neurotransmitter, which activates receptors on the postsynaptic cell (bottom). Neurotransmission (Latin: transmissio "passage, crossing" from transmittere "send, let through"), is the process by which signaling molecules called neurotransmitters are released by the axon terminal of a neuron (the presynaptic neuron), and bind to and react with the receptors on the dendrites of another neuron (the postsynaptic neuron). A similar process occurs in retrograde neurotransmission, where the dendrites of the postsynaptic neuron release retrograde neurotransmitters (e.g., endocannabinoids) that signal through receptors that are located on the axon terminal of the presynaptic neuron, mainly at GABAergic and glutamatergic synapses. Neurotransmission relies upon: the availability of the neurotransmitter; the release of the neurotransmitter; the connection made between the postsynaptic receptor by the neurotransmitter; activity from the postsynaptic cell; and the subsequent removal or deactivation of the neurotransmitter. In response to a threshold action potential or graded electrical potential, a neurotransmitter is released at the presynaptic terminal. The released neurotransmitter may then move across the synapse to be detected by and bind with receptors in the postsynaptic neuron. Binding of neurotransmitters may influence the postsynaptic neuron in either an inhibitory or excitatory way. The binding of neurotransmitters to receptors in the postsynaptic neuron can trigger either short term changes, such as changes in the membrane potential called postsynaptic potentials, or longer term changes by the activation of signaling cascades. Neurons form complex biological neural networks through which nerve impulses (action potentials) travel. Neurons do not touch each other (except in the case of an electrical synapse through a gap junction); instead, neurons interact at close contact points called synapses. A neuron transports its information by way of an action potential. When the nerve impulse arrives at the synapse, it may cause the release of neurotransmitters, which influence another (postsynaptic) neuron. The postsynaptic neuron may receive inputs from many additional neurons, both excitatory and inhibitory. The excitatory and inhibitory influences are summed, and if the net effect is inhibitory, the neuron will be less likely to "fire" (i.e., generate an action potential), and if the net effect is excitatory, the neuron will be more likely to fire. How likely a neuron is to fire depends on how far its membrane potential is from the threshold potential, the voltage at which an action potential is triggered because enough voltage-dependent sodium channels are activated so that the net inward sodium current exceeds all outward currents. Excitatory inputs bring a neuron closer to threshold, while inhibitory inputs bring the neuron farther from threshold. An action potential is an "all-or-none" event; neurons whose membranes have not reached threshold will not fire, while those that do must fire. Once the action potential is initiated (traditionally at the axon hillock), it will propagate along the axon, leading to release of neurotransmitters at the synaptic bouton to pass along information to yet another adjacent neuron. Synthesis of the neurotransmitter. This can take place in the cell body, in the axon, or in the axon terminal. Storage of the neurotransmitter in storage granules or vesicles in the axon terminal. Calcium enters the axon terminal during an action potential, causing release of the neurotransmitter into the synaptic cleft. After its release, the transmitter binds to and activates a receptor in the postsynaptic membrane. Deactivation of the neurotransmitter. The neurotransmitter is either destroyed enzymatically, or taken back into the terminal from which it came, where it can be reused, or degraded and removed. Neurotransmitters are spontaneously packed in vesicles and released in individual quanta-packets independently of presynaptic action potentials. This slow release is detectable and produces micro-inhibitory or micro-excitatory effects on the postsynaptic neuron. An action potential briefly amplifies this process. Neurotransmitter containing vesicles cluster around active sites, and after they have been released may be recycled by one of three proposed mechanism. The first proposed mechanism involves partial opening and then re-closing of the vesicle. The second two involve the full fusion of the vesicle with the membrane, followed by recycling, or recycling into the endosome. Vesicular fusion is driven largely by the concentration of calcium in micro domains located near calcium channels, allowing for only microseconds of neurotransmitter release, while returning to normal calcium concentration takes a couple of hundred of microseconds. The vesicle exocytosis is thought to be driven by a protein complex called SNARE, that is the target for botulinum toxins. Once released, a neurotransmitter enters the synapse and encounters receptors. Neurotransmitters receptors can either be ionotropic or g protein coupled. Ionotropic receptors allow for ions to pass through when agonized by a ligand. The main model involves a receptor composed of multiple subunits that allow for coordination of ion preference. G protein coupled receptors, also called metabotropic receptors, when bound to by a ligand undergo conformational changes yielding in intracellular response. Termination of neurotransmitter activity is usually done by a transporter, however enzymatic deactivation is also plausible. Each neuron connects with numerous other neurons, receiving numerous impulses from them. Summation is the adding together of these impulses at the axon hillock. If the neuron only gets excitatory impulses, it will generate an action potential. If instead the neuron gets as many inhibitory as excitatory impulses, the inhibition cancels out the excitation and the nerve impulse will stop there. Action potential generation is proportionate to the probability and pattern of neurotransmitter release, and to postsynaptic receptor sensitization. Spatial summation means that the effects of impulses received at different places on the neuron add up, so that the neuron may fire when such impulses are received simultaneously, even if each impulse on its own would not be sufficient to cause firing. 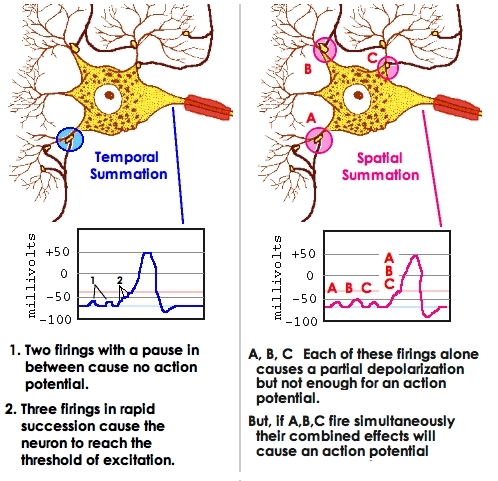 Temporal summation means that the effects of impulses received at the same place can add up if the impulses are received in close temporal succession. Thus the neuron may fire when multiple impulses are received, even if each impulse on its own would not be sufficient to cause firing. Neurotransmission implies both a convergence and a divergence of information. First one neuron is influenced by many others, resulting in a convergence of input. When the neuron fires, the signal is sent to many other neurons, resulting in a divergence of output. Many other neurons are influenced by this neuron. Cotransmission is the release of several types of neurotransmitters from a single nerve terminal. At the nerve terminal, neurotransmitters are present within 35–50 nm membrane-encased vesicles called synaptic vesicles. To release neurotransmitters, the synaptic vesicles transiently dock and fuse at the base of specialized 10–15 nm cup-shaped lipoprotein structures at the presynaptic membrane called porosomes. The neuronal porosome proteome has been solved, providing the molecular architecture and the complete composition of the machinery. Recent studies in a myriad of systems have shown that most, if not all, neurons release several different chemical messengers. Cotransmission allows for more complex effects at postsynaptic receptors, and thus allows for more complex communication to occur between neurons. In modern neuroscience, neurons are often classified by their cotransmitter. For example, striatal "GABAergic neurons" utilize opioid peptides or substance P as their primary cotransmitter. ACh–vasoactive intestinal peptide (VIP) co-release. ACh–calcitonin gene-related peptide (CGRP) co-release. Noradrenaline and ATP are sympathetic co-transmitters. It is found that the endocannabinoid anadamide and the cannabinoid, WIN 55,212-,2 can modify the overall response to sympathetic nerve stimulation, and indicate that prejunctional CB1 receptors mediate the sympatho-inhibitory action. Thus can cannabinoids inhibit both the noradrenergic and purinergic components of sympathetic neurotransmission. Neurotransmission is genetically associated with other characteristics or features. For example, enrichment analyses of different signaling pathways led to the discovery of a genetic association with intracranial volume. ^ Melis M, Pistis M (December 2007). "Endocannabinoid signaling in midbrain dopamine neurons: more than physiology?". Current Neuropharmacology. 5 (4): 268–77. doi:10.2174/157015907782793612. PMC 2644494. PMID 19305743. Thus, it is conceivable that low levels of CB1 receptors are located on glutamatergic and GABAergic terminals impinging on DA neurons [127, 214], where they can fine-tune the release of inhibitory and excitatory neurotransmitter and regulate DA neuron firing. Consistently, in vitro electrophysiological experiments from independent laboratories have provided evidence of CB1 receptor localization on glutamatergic and GABAergic axon terminals in the VTA and SNc. ^ Flores A, Maldonado R, Berrendero F (December 2013). "Cannabinoid-hypocretin cross-talk in the central nervous system: what we know so far". Frontiers in Neuroscience. 7: 256. doi:10.3389/fnins.2013.00256. PMC 3868890. PMID 24391536. Direct CB1-HcrtR1 interaction was first proposed in 2003 (Hilairet et al., 2003). Indeed, a 100-fold increase in the potency of hypocretin-1 to activate the ERK signaling was observed when CB1 and HcrtR1 were co-expressed ... In this study, a higher potency of hypocretin-1 to regulate CB1-HcrtR1 heteromer compared with the HcrtR1-HcrtR1 homomer was reported (Ward et al., 2011b). These data provide unambiguous identification of CB1-HcrtR1 heteromerization, which has a substantial functional impact. ... The existence of a cross-talk between the hypocretinergic and endocannabinoid systems is strongly supported by their partially overlapping anatomical distribution and common role in several physiological and pathological processes. However, little is known about the mechanisms underlying this interaction. ... Acting as a retrograde messenger, endocannabinoids modulate the glutamatergic excitatory and GABAergic inhibitory synaptic inputs into the dopaminergic neurons of the VTA and the glutamate transmission in the NAc. Thus, the activation of CB1 receptors present on axon terminals of GABAergic neurons in the VTA inhibits GABA transmission, removing this inhibitory input on dopaminergic neurons (Riegel and Lupica, 2004). Glutamate synaptic transmission in the VTA and NAc, mainly from neurons of the PFC, is similarly modulated by the activation of CB1 receptors (Melis et al., 2004). ^ Freund TF, Katona I, Piomelli D (July 2003). "Role of endogenous cannabinoids in synaptic signaling". Physiological Reviews. 83 (3): 1017–66. doi:10.1152/physrev.00004.2003. PMID 12843414. ^ Holden A, Winlow W (1984). The Neurobiology of Pain: Symposium of the Northern Neurobiology Group Held at Leeds on 18 April 1983 (1st ed.). Manchester Univ Pr. p. 111. ISBN 978-0719010613. ^ Squire L, Berg D, Bloom FE, du Lac S, Ghosh A, Spitzer NC (2013). Fundamental neuroscience (4th ed.). Amsterdam: Elsevier/Academic Press. pp. 133–181. ISBN 978-0-12-385870-2. ^ Williams SM, McNamara JO, Lamantia A, Katz LC, Fitzpatrick D, Augustine GJ, Purves D (2001). Purves D, Augustine GJ, Fitzpatrick D, et al., eds. Summation of Synaptic Potentials. Neuroscience (2nd ed.). Sunderland (MA): Sinauer Associates. ^ Wang JH, Wei J, Chen X, Yu J, Chen N, Shi J (September 2008). "Gain and fidelity of transmission patterns at cortical excitatory unitary synapses improve spike encoding". Journal of Cell Science. 121 (Pt 17): 2951–60. doi:10.1242/jcs.025684. PMID 18697836. ^ Yu J, Qian H, Chen N, Wang JH (2011). "Quantal glutamate release is essential for reliable neuronal encodings in cerebral networks". PLOS One. 6 (9): e25219. doi:10.1371/journal.pone.0025219. PMC 3176814. PMID 21949885. ^ Yu J, Qian H, Wang JH (August 2012). "Upregulation of transmitter release probability improves a conversion of synaptic analogue signals into neuronal digital spikes". Molecular Brain. 5 (26): 26. doi:10.1186/1756-6606-5-26. PMC 3497613. PMID 22852823. ^ Hevern VW. "PSY 340 Brain and Behavior". Archived from the original on February 19, 2006. ^ Anderson LL (2006). "Discovery of the 'porosome'; the universal secretory machinery in cells". Journal of Cellular and Molecular Medicine. 10 (1): 126–31. doi:10.1111/j.1582-4934.2006.tb00294.x. PMC 3933105. PMID 16563225. ^ Lee JS, Jeremic A, Shin L, Cho WJ, Chen X, Jena BP (July 2012). "Neuronal porosome proteome: Molecular dynamics and architecture". Journal of Proteomics. 75 (13): 3952–62. doi:10.1016/j.jprot.2012.05.017. PMC 4580231. PMID 22659300. ^ Trudeau LE, Gutiérrez R (June 2007). "On cotransmission & neurotransmitter phenotype plasticity". Molecular Interventions. 7 (3): 138–46. doi:10.1124/mi.7.3.5. PMID 17609520. ^ Thomas EA, Bornstein JC (2003). "Inhibitory cotransmission or after-hyperpolarizing potentials can regulate firing in recurrent networks with excitatory metabotropic transmission". Neuroscience. 120 (2): 333–51. doi:10.1016/S0306-4522(03)00039-3. PMID 12890506. ^ Pakdeechote P, Dunn WR, Ralevic V (November 2007). "Cannabinoids inhibit noradrenergic and purinergic sympathetic cotransmission in the rat isolated mesenteric arterial bed". British Journal of Pharmacology. 152 (5): 725–33. doi:10.1038/sj.bjp.0707397. PMC 2190027. PMID 17641668. ^ Adams HH, Hibar DP, Chouraki V, Stein JL, Nyquist PA, Rentería ME, et al. (December 2016). "Novel genetic loci underlying human intracranial volume identified through genome-wide association". Nature Neuroscience. 19 (12): 1569–1582. doi:10.1038/nn.4398. PMC 5227112. PMID 27694991. This page was last edited on 11 March 2019, at 15:02 (UTC).